Pair of elegant French two-arm bronze or brass and crystal wall sconces attributed to Jules Leleu. 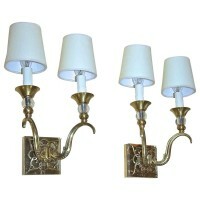 Each sconce uses 2 – 40 watt max candelabra base bulbs, newly wired. Paper shades are included. Overall height with shades 14″, without shades 10″. Backplates are 4″ square.